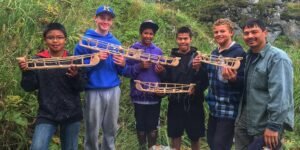 It’s been over a century since members of the Sugpiat community on Southern Alaska’s Kodiak Island have used a traditional Angyaaq. These boats we re once an essential part of their livelihood and culture for thousands of years before being destroyed by Russian settlers in the 1860s. The knowledge of these boats was thought to be lost. But all of that changed when Sven Haakanson, Curator of North American Anthropology and a member of the Sugpiat community, turned to a model Angyaat from the Burke and other museum collections to revitalize this traditional boat-building practice and build two Angyaaq—one here at the Burke Museum in Seattle and one in Kodiak Island, Alaska. “The idea was to take that traditional knowledge that’s embodied in the original model and bring it back home, back to my tribe and back to the community so that we can then use it again and celebrate it,” Sven said.